God, before the foundation of the world, had Liberty Baptist Church in his heart and in his mind. God has always provided a place where he records his name. A place where the Lord Jesus is preeminent, God the Father is honored and the Holy Spirit has liberty to work through God’s word for the salvation of sinners and the edification of believers. The place of worship must be where God records His name and Christians led by the Holy Spirit worship Him in spirit and in truth. “. . . in all places where I record my name I will come unto thee, and I will bless thee.” Exodus 20:24 “For we are the circumcision, which worship God in the spirit, and rejoice in Christ Jesus, and have no confidence in the flesh. Philippians 3:3. God provided Jesus Christ the Chief Shepherd of the sheep, the pastor the under shepherd and the congregation the flock. The pastor takes the oversight and not the lordship over God’s heritage. Take heed therefore unto yourselves, and to all the flock, over the which the Holy Ghost hath made you overseers, to feed the church of God, which he hath purchased with his own blood. Acts 20:28. Feed the flock of God which is among you, taking the oversight thereof, not by constraint, but willingly; not for filthy lucre, but of a ready mind; Neither as being lords over God's heritage, but being ensamples to the flock. 1 Peter 5:2, 3. The Apostle Paul said, “Moreover I call God for a record upon my soul, that to spare you I came not as yet unto Corinth. Not for that we have dominion over your faith, but are helpers of your joy: for by faith ye stand.” 2 Corinthians 1:23, 24. There comes a time when some Christians need spiritual fellowship and worship of the Lord Jesus which they have not found at places attended. These believers desire to worship the Lord Jesus Christ in spirit and in truth and strive for liberty to do so without interference of religious hierarchies or ecclesiastical overlords. The sovereign God does not leave his sheep without a shepherd. “For where two or three are gathered together in my name, there am I in the midst of them.” Matthew 18:20. “But the hour cometh, and now is, when the true worshippers shall worship the Father in spirit and in truth: for the Father seeketh such to worship him. God is a Spirit: and they that worship him must worship him in spirit and in truth.” John 4:23, 24. “Now the Lord is that Spirit: and where the Spirit of the Lord is, there is liberty.” 2 Corinthians 3:17. Simon Peter answered and said, “Thou art the Christ, the Son of the living God. Jesus answered and said,” . . . . . and upon this rock I will build my church; and the gates of hell shall not prevail against it.” Matthew 16:16, 18. The Holy Spirit led me to resign as assistant pastor of Calvary Baptist Church of Toccoa, GA on Sunday evening July 2, 1995. Much time was spent in fasting and prayer for God’s direction and his leading for future full time work in the ministry. Wednesday July 5th I preached at the Shirley Grove Baptist Church of Turnerville, GA. From July 9th through August 6th, Frances and I attended Sunday and Wednesday services between Shirley Grove Baptist Church of Turnerville, GA and Ridgeway Baptist Church of Maysville, GA. Brother Billy Manus is pastor. of Ridgeway Baptist. During this time God was answering prayer to perform something unusual according to his divine plan. A lasagna supper was prepared by William and Mary Tugend at their home on Friday, July 14, 1995. Frances and I were invited to this supper. When we arrived, we discovered that twenty-four (24) others were invited and attended. The Holy Spirit blessed this time of fellowship which turned out to be a prayer meeting where singing, testimonies, prayer, praising and worshipping of the Lord Jesus Christ was experienced. The presence of the Lord was so real that this small group decided to meet for a second time of worship and fellowship in the Spirit of the Lord Jesus Christ. All of those present were seeking a place to worship the Lord. A second meeting was held on Monday evening, July 24, 1995 at the home of Andrew and Imogene Losier on Scenic Drive, Toccoa. Forty-four (44) people were present at this prayer meeting. There was a strong leading of the Holy Spirit that this group of believers needed to be formed into a body as a church family in the name of the Lord Jesus Christ. Only the Holy Ghost would guide and impress upon individuals to record events and number people by names. God’s purpose was to gather together a people, saved by the grace of God, in the name of the Lord Jesus Christ, to establish a church where God could add to the church by saving the lost. On some following pages recorded by June Westmoreland and Bill Tugend are notes and signatures of thirty six who were present at the July 24th meeting. Adult S. S. Teacher: Dr. Andrew J. Losier, Sr.
Fifty one (51) were present at the 2nd prayer meeting on Wednesday, August 16th. Wednesday prayer meetings continued until the building was ready for services. Every thing that a physical church needed for worship services was in this building, except offering plates, song books, a communion table and a communion set. Forty song books were donated by Ridgeway Baptist Church of Maysville, GA. Eugene and June Westmoreland purchased the communion table. Others contributed to purchase the communion set. A hat was used for taking offerings. “Now unto him that is able to do exceeding abundantly above all that we ask or think, according to the power that worketh in us, Unto him be glory in the church by Christ Jesus throughout all ages, world without end. Amen.” Ephesians 3:20, 21. The Lord Jesus Christ had provided the means for a Bible believing, Holy Spirit led people to be formed into a New Testament Church. The first Sunday worship services were held on August 20, 1995 as Liberty Baptist Fellowship. Fifty-five attended Sunday School, seventy-two attended the worship service. Thirty-nine joined as candidates for future membership of the Church. By the following Sunday thirteen others had joined to total fifty-two as candidates for charter members at the time of formal organization. Liberty Baptist Church was organized Sunday, September 17, 1995. Seventy-four attended Sunday School and one hundred and two attended the morning service. The little concrete block building was filled to capacity. Brother Billy Manus, pastor of Ridgeway Baptist Church, Maysville, Georgia, preached the organizational sermon from Matthew 16:13-18. Dinner was served in the small fellowship hall and under a rented tent. The first mission work of the Church was The Christian Literature and Bible Center, Inc. founded and directed by Dr. Andrew J. Losier, Sr. The Lord used the ministry of Dr. Losier for 43 years of mission work in Africa where he founded the Christian Literature and Bible Center, Inc. The Lord used this ministry of the printed page throughout the world, where over a million copies of his 36 books were sent free of charge by mail bags and containers to National Christian Leaders and Pastors in many countries. Liberty Baptist paid postage for one mail bag each week in addition to $100 monthly support. The Liberty youth became actively involved in filling packets with Bibles and study books for requests received from hundreds of young believers in Africa and other countries. Dr. Losier dedicated his last book “The Judgments of God” in honor of Liberty Baptist Church. Brother Losier was the first adult Sunday School teacher at Liberty. A building fund was started after the Church was organized in September of 1995 and on Sunday, December 8, 1996 the Church voted to purchase a 9.6 acre tract of property from Attorney Alton Adams. The property located on Fairground Road, Cawthon Road and Hwy 17 By-Pass was purchased on Thursday, December 19, 1996 for $75,000. $50,000 was paid at the purchase time with the remaining $25,000 to be paid at a later time. Trustees of the Church signing for the purchase were Donald English, Doug Westmoreland, Doug Rickman, and Fred Overall. David Simons, Minister of finance, signed the check for the purchase. As of March 9, 1997 the balance of $25,000 was paid in full. Mr. Alton Adams donated $5,000 to the Church for a charitable gift. Andrew Losier, Gene Westmoreland and I went to the property, knelt down, asked God to bless the property and to record His name there, where sinners could come to Jesus Christ to be saved and God’s people could come worship the Lord. A building committee was elected consisting of Jackie LeCroy, Alfred Galloway, Frank Rhoades, Sam Williams and Buddy Williams. On Saturday, April 5, 1997, the Church family assembled at the property to begin clearing the land for a church building and parking lot. The ladies of the church provided tail gate lunch for all workers. God’s presence and blessing on this work was real and everyone was excited and rejoicing about what God was doing. June 25th building permit # 588 and sewer permit #5912 were obtained from Stephens County. Frank and Betty Rhoades were new members of the church. Brother Frank presented a Certificate of Deposit Loan plan for borrowing money from church members and friends to build the building. A faith promise survey was conducted among the Church members to determine pay-back on loans for the building. The loan project consisted of borrowing money from church members and friends with Certificates of Deposit issued to each lender for the loans. Interest was paid to the certificate holders semi-annually. A $500 minimum was set for these certificates. IRS interest form 1099 was issued to the Certificate of Loan holders and to the IRS on the first of January each year. Certificates of Deposit Loans were issued for a two year series certificate at 7.0% interest and the amount borrowed was $115,000, a five year series at 7.5% interest with $80,000 borrowed and a seven year series at 8.0% interest of which $85,000 was borrowed. This $280,000 were borrowed from individuals as needed to continue the progress of the construction. The Lord always supplied abundantly on time. Now unto him that is able to do exceeding abundantly above all that we ask or think, according to the power that worketh in us, Unto him be glory in the church by Christ Jesus throughout all ages, world without end. Amen. Ephesians 3:20, 21. June and July of 1997 Jackie LeCroy and Alfred Galloway donated grading and back hoe equipment with their labor for grading and digging footing. Larry LeCroy donated labor for grading and all able bodied men of the church labored together in the work. Concrete was poured July 30th and August 6th using 62 yards of concrete. Labor for laying concrete blocks was contributed by Sam Williams, Sonny Kelley and his crew and Phil Ivester and his crew. On September 27th the foundation was ready for construction to begin. Contract for the framework was given to O. H. Frady Construction. A crane was rented from Phillip Hulsey of Star Auto Electric of Cornelia to set the roof trusses and, after the roofing was finished by David Reed, the steeple was set in place. The wind blew the steeple so that it had to be lowered back down, until the wind ceased enough to hoist it back up. The preacher stood inside the cupola to align the steeple with the bolts. On November 24, 1997 framing of the building was completed with the exterior doors and windows installed. From December 1997 to December 1998 work progressed on the building. Labor for plumbing, water, septic tank installation, electrical wiring and gas line installation was supplied by Jackie LeCroy and Alfred Galloway with donations of much material. Jeff Moore, Johnny Burch, James Evans and other church members donated labor. Jimmy Whiten, East State Plumbing, Inc donated his services. Hanging and finishing the 12 feet overhead sheetrock was contracted to Gerrin Drywall of Cornelia. Brick work was contracted to Phil Ivester of Clarkesville who sub-contracted Ed and Clarence Williams’s crew of Toccoa. Vinyl siding was contracted to Wayne Nations of Cornelia. A-1 Gutters of Clarkesville was contracted for the gutter work. Labor was donated by Jim Rhoades and Joseph Hughes for hanging the interior doors and cutting the trim work for all the rooms. Liberty youth and ladies of the church helped paint the trim work and interior walls. Donald English with the help of Edward English and Bill Evans donated labor to lay carpet. Buddy Williams built the pulpit and Tex Murray built the choir petitions and finished the pulpit and the petitions to match the furniture. Tex also refinished the communion table with the permission of Eugene and June Westmoreland who donated the table. Foyer tile was donated by Fred and Judy Williams which was laid by Fred, Max Sparks and Steve Hughes. Sheetrock for the fellowship hall was donated by Jack and Brenda Cash. Telephones and lines were contributed and installed by Bill Tugend. Donald and Todd Watkins contributed labor to install the sound system. A new church building needed new offering plates which were donated by Bill and Mary Tugend. Jackie LeCroy and Alfred Galloway donated gravel and labor for the parking lot. Franklin D. and Betty L. Rhoades donated mature landscaping plants to the church. These plants included: 158 Variegated Lithrope 1 gallon size and 171 Variegated Lithrope 2 gallon size; 148 Day Lillies with a minimum of 5 fans and 159 Day Lillies with a minimum of 10 fans. Brother Frank and sister Betty also donated $8,000 to purchase the baby grand piano from Toccoa Falls Bible College. Brother Frank had suffered much during the 1998 year undergoing extensive chemotherapy and radium treatments. Brother Frank did not live to see the completed building, but rejoiced when he saw it in the last stages of being finished. The men, ladies and children worked together in unity, harmony and fellowship in putting together the place of worship of the Lord Jesus Christ. There was great fellowship among the church family in laboring together to accomplish the work of finishing the building. Some others who contributed labor for the building were Michael Collins, Jefferson Moore, Fred Overall, Johnny Burch, Mike Ballenger, Gene Westmoreland, Alton Stowe, Wade Ivester, Josh Powell, William Long, Doug Westmoreland, William Tugend, Will Carpenter, Fred Williams, Jr., Jason Taylor, Roger Ramsey, David Williams, David Simons, Doug Rickman, Ernest Hudson, Tex Murray, Larry Martin, Calter Moore, Mike Randall, Don Readon, Ted Higginbotham, Nicholas Simons, Kenyon Stowe, Hoyt Jameson, Scott Westmoreland, John Stringer and several others. The Church is one body with many members laboring together to magnify the Lord Jesus Christ with the provisions God placed in our hands, “And the LORD spake unto Moses, saying, Speak unto the children of Israel, that they bring me an offering: of every man that giveth it willingly with his heart ye shall take my offering. . . . . And let them make me a sanctuary; that I may dwell among them.” Exodus 25:1, 2, 8. However, in the New Testament church God dwells not in physical buildings, but in the bodies of born again believers. What? know ye not that your body is the temple of the Holy Ghost which is in you, which ye have of God, and ye are not your own? For ye are bought with a price: therefore glorify God in your body, and in your spirit, which are God's. 1 Corinthians 6:19, 20. “Now thanks be unto God, which always causeth us to triumph in Christ, and maketh manifest the savour of his knowledge by us in every place. For we are unto God a sweet savour of Christ, in them that are saved, and in them that perish: To the one we are the savour of death unto death; and to the other the savour of life unto life. And who is sufficient for these things? For we are not as many, which corrupt the word of God: but as of sincerity, but as of God, in the sight of God speak we in Christ. 2 Corinthians 2:14-17. Occupancy of the new building and first services were held on Sunday, December 20, 1998 with more than 250 in attendance. God is faithful who has promised and brought such great things to pass. “Call unto me, and I will answer thee, and shew thee great and mighty things, which thou knowest not.” Jeremiah 33:3 Along with Dr. Andrew J. Losier, we believed God answers prayer. This verse was brother Andy’s favorite Bible verse. Work continued on the fellowship hall by the men and women working together in the unity of the Spirit of the Lord. Jack and Brenda Cash donated the sheetrock. 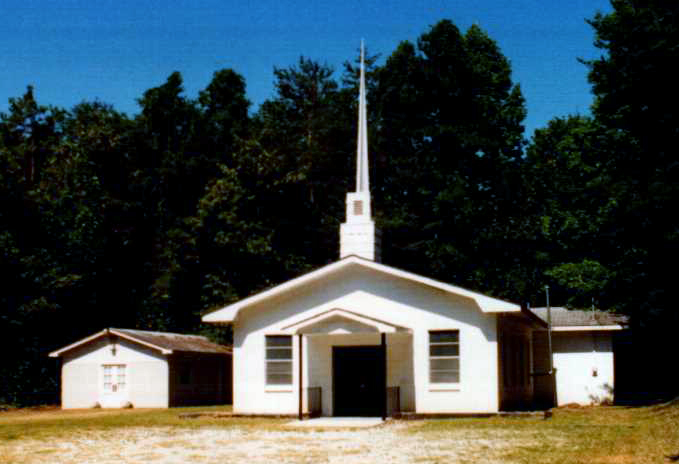 The fellowship hall was finished and ready for the fourth Homecoming on Sunday, September 19, 1999. December 1, 1999 the first $115,000 of the Certificate Loans were paid off plus six months interest of $10,425 a total of $125,425. A fourth, fifth and sixth series of Certificates of Deposit Loans for $195,000 were initiated in 2001 to build a Family Life Center building. Grading work for the building was contributed and performed by Jackie LeCroy and Alfred Galloway. Concrete for a retainer wall and the foundation of the building was poured by Gregg Gunn and crew on October 16, 2001. Premier Building Contractors erected the 100’ x 150’ steel building which began on October 22nd. In November Jackie LeCroy and Alfred Galloway were instrumental in and conducted the hanging of the lights, installing the plumbing, putting in the water and gas lines and in December they poured the concrete floor with many men of the church assisting in the work. As of December 2001 $348,521.50 had been paid out, which included $70,000 for the land, Certificate Loans of $195,000, interest in the amount of $57,265.50 and $26,256 for a 2000 van. The outstanding Certificate Loans balance of $280,000 remained to be paid. All of this was in addition to the regular tithes and offerings of the church family. Many members of the church family had labored together to work on the interior of the Life Center building which was named for Dr. Andrew J. Losier, Sr., the church’s first missionary. The building was completed and dedicated in August 2003. In August the roof of the church building was replaced. CD loans of $12,000 were borrowed and $8,000 token from the church treasury to pay for the $20,000 roofing. The CD loan balance was now at $47,000. At the end of 2008 the CD loans had been paid down to $30,000. The burden of the ministry of the Holy Spirit that rests upon the pastor moves him to intercession at the throne of grace not only for salvation of souls, the edification of God’s people, but also for the leadership for the ministry of the church. The burden of the gospel of Christ and the ministry of the church proceed from and is accomplished by the power of the Holy Spirit of God. God honors faithfulness and effectual fervent prayer. Prayer had been made for several years for God to provide for the future under shepherd of the church. During the watch night service December 31, 2008, the Holy Spirit spoke to my heart while Scott Westmoreland was preaching that Scott should be the succeeding pastor of Liberty Baptist Church. After further prayer for assurance of God’s leading, the purpose of God was related to the church family for Scott to be the next pastor of Liberty Baptist Church. The church responded with much excitement and anticipation for what God would bring to pass. After communing with Scott regarding what God had revealed to me, Scott was very excited about it and said God had been dealing with him for some time about moving to north Georgia. Scott preached Sunday evening February 8, 2009 and preached a revival meeting February 16th through 18th. Caleb Means surrendered to preach the gospel of Christ on Wednesday, February 18, 2009. Sunday March 15, 2009 pastor Albert Hudson recommended Scott Westmoreland to the church to be voted on as pastor of the church. The church voted almost unanimously for Scott to be pastor with four votes against. The church accepted the retirement of pastor Albert Hudson. At the age of seventy five things begin to slow down, but not stop. Scott Westmoreland was among those who were saved, baptized and called to preach as a result of God’s working through Liberty Baptist Church. Scott is a graduate of Victory Baptist Bible College of North Augusta, SC. He had served four years as assistant pastor of Lighthouse Baptist Church of Greenwood, SC. There are always mixed emotions that accompany changes the Lord requires pertaining to his omniscient will. Through these changes God’s grace teaches us to trust and follow His leading. Praise belongs to the Lord for people who can recognize the grace of God. Who, when he came, and had seen the grace of God, was glad, and exhorted them all, that with purpose of heart they would cleave unto the Lord. Acts 11:23. There are always some who follow their feelings and mixed emotions rather than allowing the Spirit of God to produce peace in their lives, and they endure the heart ache and suffering that ensue. Scott was ordained to the gospel ministry on the evening of March 22, 2009 at the Lighthouse Baptist Church of Greenwood, SC. Lighthouse Church graciously provided their bus for Liberty Baptist to participate in Scott’s ordination. Sunday morning March 29th a transitional service was conducted at Liberty Baptist to pass the mantle of pastorate from Albert Hudson to Scott Westmoreland. The burden of the gospel of Christ was passed onto Scott. As the Lord gave three tasks for Elijah to do in 1 Kings 19:15, 16 and 19, God took him before the tasks were finished and the mantle was passed on to Elisha who finished them. After the service a meal was provided in the fellowship hall by the church family. In the afternoon there was a time of fellowship and singing by Gold City, Liberty Choir and Liberty Quartet. Scott took the pastorate of Liberty Baptist Church Wednesday, April 1, 2009. Sunday afternoon, August 8, 2010 Scott Westmoreland met with the deacons and announced that the Lord led him to resign as pastor of the church. Scott’s resignation was a complete surprise to the church family, however God’s will was accepted. Wednesday evening service August 11th Caleb Means preached and after the service a fellowship meal was held for Scott, Teresa and Katlin to bid them farewell with God’s blessing. Albert Hudson was named interim pastor until God supplies according to his will and purpose. The church was still praying for a pastor leaving it in the hands of the Lord for His will. Gregg Gun poured a concrete pad for Stacy Penland and invited him and his family to visit Liberty. Brother Penland and his family had recently moved to Toccoa from Americus, GA where he had pastored Greater Vision Baptist Church for nine years. Immediately the Penlands were a blessing to all the people of Liberty. On Wednesday, December 15, 2010 Brother Stacy preached and related how God had led them to Toccoa. After the service it was discovered that Stacy’s wife Tonya, daughter Kalie and son Titus sang. They had such a sweet spirit and harmony, the church fell in love with them. Everyone felt that God had led them to Toccoa and to Liberty Baptist for a specific purpose and in answer to prayer. In the Watch Night service Stacy Penland, Jason Long and James Harvey preached. The singing was by the Liberty Choir, Liberty Quartet, Stacy Penland family and other Liberty special singers. Sunday January 9th, Stacy Penland with his wife Tonya, daughter Kalie and son Titus joined the church by letters from Greater Vision Baptist Church, Americus, GA. Brother Penland preached Sunday morning January 16th. Sunday evening January 30th, the deacons being led of the Holy Spirit met with brother Stacy Penland regarding the pastorate of Liberty Baptist Church. Stacy Penland was presented to the church as candidate for pastor on Sunday morning February 6, 2011 to be voted on the following Sunday morning. Sunday morning February 13th with a written Yes or No vote Stacy Penland was elected to be pastor of Liberty Baptist Church. There were two No votes. During 2011 $30,000 of the CD loans were paid plus interest. The remaining $5,000 CD loan plus $150 interest will be paid off the end of November. A special Thanksgiving service was held on Sunday evening November 20th to give the Lord praise for all His works at Liberty. In whom also we have obtained an inheritance, being predestinated according to the purpose of him who worketh all things after the counsel of his own will: Ephesians 1:11. For it is God which worketh in you both to will and to do of his good pleasure. Philippians 2:13 Now unto him that is able to do exceeding abundantly above all that we ask or think, according to the power that worketh in us,Unto him be glory in the church by Christ Jesus throughout all ages, world without end. Amen. Ephesians 3:20, 21. Through the years, the Lord proved his faithfulness, loving-kindness and tender mercies for his people. The Lord did great and mighty things for many people. In the first meeting with the deacons, Stacy Penland recommended Albert Hudson to be kept on as assistant pastor. This recommendation was put before the church and the vote was in favor thereof. Over the past sixteen years God’s people of Liberty Baptist Church have given above $2,000,000 in tithes and offerings for the ministry of God’s work. All the praise goes to the Lord Jesus Christ for his wonderful works among men. What shall we then say to these things? If God be for us, who can be against us? He that spared not his own Son, but delivered him up for us all, how shall he not with him also freely give us all things? Romans 8:31, 32. All those who have been faithful to the Lord Jesus Christ will be greatly reward for their service at His coming. We are looking forward for that which the Holy Spirit of God will lead to be done in time to come. The souls yet to be saved and changes in the lives of people who have no hope, God will perform by his grace. Praise His Name! “Wherefore God also hath highly exalted him, and given him a name which is above every name: That at the name of Jesus every knee should bow, of things in heaven, and things in earth, and things under the earth; And that every tongue should confess that Jesus Christ is Lord, to the glory of God the Father.” Philippians 2:9-11. May the Lord Jesus Christ continue to be exalted and worshipped in Liberty Baptist Church. May the church always remain faithful and true to the word of God and follow the leading of the Holy Spirit until he comes. Looking for that blessed hope, and the glorious appearing of the great God and our Saviour Jesus Christ; Who gave himself for us, that he might redeem us from all iniquity, and purify unto himself a peculiar people, zealous of good works Titus 2:13, 14. God works in marvelous, mysterious ways accomplishing his divine purpose. God had been working by the Holy Ghost in the lives of the Penland family to bring them to Toccoa, GA. Brother Stacy Penland must relate the events God wrought in their lives to bring them here, if he chooses to add them to these words. What a journey the Lord has led us on. This last great step of faith that brought us to Liberty Baptist Church began in July of 2009. I remember it as if it was just a minute ago. My family was in a camp meeting in Primrose, Georgia. The men were in the prayer room. As we were giving our prayer request, the Holy Ghost began to move. It was time for the service to start so the Pastor sent a young man down to the sanctuary to tell the others just to go to the altar and pray. Just a few moments went by when he made a statement that was sent by the Holy Ghost. He said “This meeting is about you as men of God knowing you are serving God in the right place. Men, make sure you are where you are supposed to be—doing what you are supposed to be doing.” He said “If I was not, I would make a change.” Little did he know that he was sent by God for me. The Holy Ghost smote my heart—He was talking to me. Then next Sunday morning service, I called the men of our church to meet after the service. I made a statement “Something is going to have to change around here—either youns or me—but something needs to change so God can move.” To shorten up what all went on, things for me were up and down. I had no peace with what was going on. We had seen God give us that land, sell the old meeting place, give us a place to worship while we were building the new church, and save people during all this. We had gone through all the “new kid on the block” era and now I was going to have to leave. I had settled it that it was going to take a lifetime to build a work for God here, and now this. My family and I were prepared to labor there the rest of our lives. The ninth year of serving there had come when there was nothing else I could do but admit that the time had come to surrender to what the Lord was doing. It was time for someone else to take them to the next step. As you know, that was not an easy thing to do. That Wednesday night service with the core of the church there, I shared with them my heart, gave them a 30 day notice and we went home and cried for days. The very next day, the church people came to our house and asked us to reconsider staying. We all agreed to pray for two more weeks and then confirm it. I really thought at the time that we could stay but again the Lord made it as clear as a spring day—we were done. We were praying the Lord would allow us to move back north closer to our birth place. We had been around other areas our whole ministry and seen the different styles of worship and we preferred the mountain style. At this time, I was working part time for Sears Home Improvement installing windows and doors. The Lord has always supplied for us through a window job or a willing child of God but God always comes through for us. The office I worked out of was in Norcross, GA, so moving north was a great plan. We began to look for a house to rent in Gainesville or in Commerce. Those places would work good. I have always preached to make sure there is a good church in the area you move to so we started looking for both. Our time was limited because of living in the church pastorium and we needed to be moved by November 18, 2010. This left us less than three weeks. We were still praying but nothing was coming together. Tonya’s brother, Travis, (Pastor at Cove Creek Baptist Church in Pickens, SC) asked if we would be interested in Toccoa. At first I believed that to be too far away from Norcross. Through prayer, Tonya and I agreed to look on the Internet for some houses in Toccoa and call a Real Estate Agent. We called a lady by the name of Joni Scott. She said she would try to find some houses but purchasing would be better than renting. My reply was that we would rather rent. She e-mailed us some house pictures and we began to look. We made an appointment on Friday, October 29, 2010 to look at some houses. Friday came and we went house looking. We looked at several houses but just one touched our heart—a little house on the side of the hill on Black Mountain Road. Through much praying and looking at this house we called Joni and made an offer on the house. Praying “If Toccoa is where you want us Lord, your will be done.” Joni said we should hear something in a few days; maybe by Tuesday on the offer. Within one hour, Joni was calling back with a counter offer. This was great. Joni had already had us pre-approved on a loan for enough to accept this offer. The only hold up was we needed a place to live before the closing on the house. Barbara and Ken Payne were the owners of the house and agreed that we could go ahead and move in before closing. We knew there had to be a church needing a Pastor within driving distance of this house because God had answered our prayers. God’s plan was coming together for our lives. Finally the time had come, November 17, and we were packing up the moving truck to move to Toccoa. We could not believe it. Toccoa was in front of us and Americus behind us. I would have never thought this day would ever come. Our plans were to spend the rest of our lives at Greater Vision Baptist Church but God had other plans. Around mid-afternoon, we backed up to our new home. It has been 12 years since we have lived in our own home. We have lived in a rental or pastorium and now we were moving into our own place. Praise the Lord! As we unloaded the trucks, I received a phone call from a church in Robbinsville, NC that was looking for a pastor. My thought was I would go preach, but the Lord had given us a home in Toccoa. He was going to give us a church to pastor within driving distance. Our family was so excited because within 24 hours of moving in, our neighbor had already invited us to church. Within the first week we received a call from a church in my home town of Burnsville, NC that is a good church. They were looking for a pastor. Again I said I would go preach but God was going to give us a church nearby. We began to visit churches in our town. We were greeted with warm welcomes but they all had pastors and they were not the one the Holy Spirit said OK to. By the first week of December we had decided to have a small shop building put up on our property and needed a concrete slab poured. Again we saw the divine hand of God work. I called Travis (my brother-in-law) to see if Joe Jones (a deacon in his church) could give me some concrete mason’s names in Toccoa. He referred me to 3 or 4 difference men. I called one and set a time for him to look at the work for Wednesday morning the 8th of December 2010. We awaited this appointment to come. Much to the divine work of God, he did not come or call. He did not even answer my call. We waited until dinner time (this is lunch to some of you) and heard nothing from him. I remember as clear as it was yesterday. My family was seated in Bell’s diner ordering a hamburger when I pulled out my list of names Brother Joe had given me. I called a man named Greg Gunn to come and look at my project. He said “I can come look but it cannot be late because I am going to church tonight.” That was fine with me because we were planning on visiting another church in town. Somewhere between 4 and 5 o’clock Greg pulls up. He came looking for a job and we were looking for a contractor but God had much bigger plans. He looked at the work and gave me a price while we were talking. We began to discuss what had brought us to Toccoa and how his church was looking for a pastor. As the conversation went on he had nothing but praise for his church and said he would love for us to come. He made sure that we knew where it was and that we were welcome to come. God had just taken a business deal and turned it into a life changing spiritual matter. After he left, I went in the house to tell my family what had just taken place. With confidence from God I knew where we were going to be. My family sat down with tears running down our faces knowing God had revealed his plan to us. We could not wait. Time could not go fast enough for us. Ten minutes until seven came and we were walking into Liberty for the first time. We were greeted with loving, open arms from everyone we saw. We remember hearing the church choir for the first time and our hearts melted. Deep inside we knew this was the church God had sent us to. Little did we know Brother Albert was telling the church to be patient and allow God to work. The people of Liberty were praying God would send them a pastor. Our hearts were knit together. Over the next two months many great services came our way. We all knew what the Lord had done. He had answered our prayers. In the deacons meeting, I remember questions were asked and answers were given. The more we talked, the more we saw God. January 30, 2011 came and Brother Albert announced to the church that there would be a vote in two weeks about me becoming the pastor. These weeks went slow but I knew the Lord was going to do it. February 13th came and the church voted. It was settled. I was the pastor of Liberty Baptist Church. As I write this, I can say I loved it then and I love it more now. We are so blessed to be a part of God’s divine plan.